Can you find vegetarian and vegan food in Buenos Aires? Absolutely! Sure, Argentina is famous for its steak and choripan, but there are plenty of options for those looking for meat-free fare. Argentina draws a lot of its culinary influence from Italy, so you can easily find pizza, pasta, and vegetable side dishes at almost any restaurant. Also, hopefully you like potatoes and pumpkin, because both are plentiful (and super tasty) in Buenos Aires! 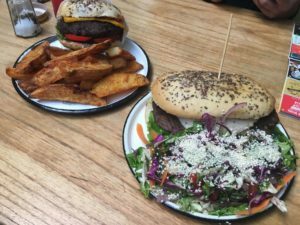 Veganism is also super trendy at the moment, so there are a number of vegan and vegan-friendly establishments, especially in the Palermo neighborhood. Here are a few that I enjoyed on my visit. Located on an adorable corner in Palermo Hollywood, Artemisia is a sun-drenched café offering daily specials as well as an à la carte menu and an enticing selection of baked goods. 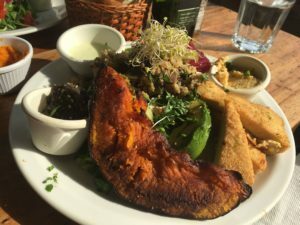 It’s not 100% vegan—they do offer some fish dishes—but it was my favorite place for both the atmosphere and food. Everything was fresh, flavorful, and nicely portioned. I ordered a salad of tofu milanesa (cutlets), roasted pumpkin, beets, sprouts, and several different dipping sauces. My friend accidentally ordered the Mexican set menu (she thought she was ordering the other set menu for the day) and she was a little disappointed by it—her quesadilla was served in a flour tortilla and a little burnt on the outside. But she couldn’t stop raving about the dessert that came with her meal—homemade ice cream with quince jam—so all in all I’d call it a win. 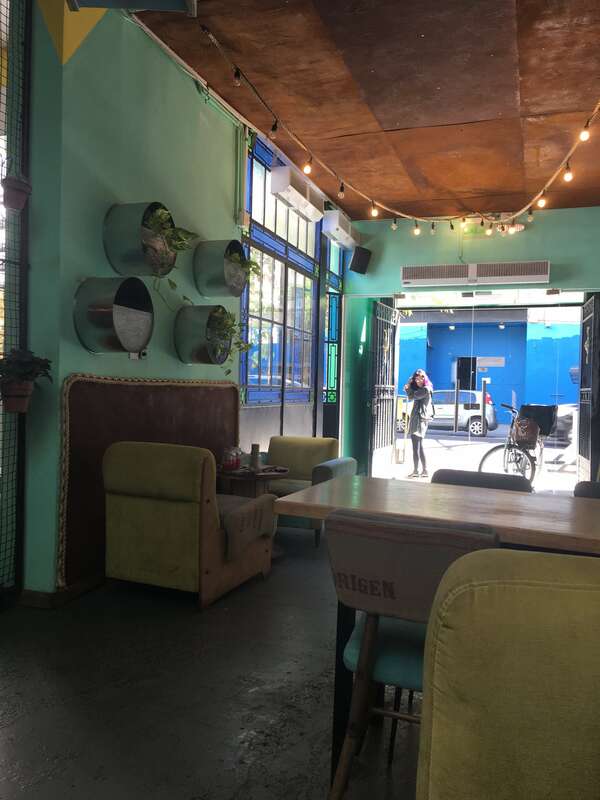 Estilo Veggie is a funky little all vegan spot painted in fun pastel colors. There’s also a plant-filled interior courtyard so you can sit outside without being out in the middle of the sidewalk. Unlike Artemisia, which seemed a bit more health-focused, at Estilo Veggie the menu is mainly vegan fast/junk food. You walk up to the counter and order and they’ll bring the food out to you, so it’s a little more casual in that sense, too. I ordered the “Clásica Completa,” a sandwich filled with seitan, ham, and cheese and served on a sweet, soft bread with a colorful, veggie-packed side salad (it was also doused with sesame seeds, which you can see in the photo below). My friend ordered the veggie burger with fries. The menu also features items to snack on like cheese plates and falafel sticks, but we definitely didn’t need anything else. In fact, we ended up taking half of everything home and eating it later, so I was surprised to see that some reviewers have complained about the portion sizes here. Maybe they’ve gotten enough complaints from people that they increased their portion sizes, or maybe we just have smaller appetites! The way to say “gluten-free” in Argentina is “sin TACC,” so gluten-free establishment Sintaxis is a clever play on words. This spacious restaurant and shop in Palermo Soho has a welcoming atmosphere, and we enjoyed sitting at the large outdoor terrace in back during our visit. The menu at Sintaxis is completely gluten-free and offers several clearly marked vegetarian items (empanadas, ravioli, and lasagna, to name a few), but vegans would probably struggle to find options here. I ordered the pumpkin ravioli, which had a pleasant chewy texture and came with a rich, creamy sauce. My gluten-free friend who brought us here swears by the empanadas and says she stops by to pick some up at least once a week. Another charming Palermo Hollywood spot is Bio, which offers organic vegetarian, vegan, raw, and gluten-free options. We stopped in once for tea and admired some of the cakes and drinks that other patrons were enjoying, and went back again another day for lunch. I ordered grilled mushrooms with spicy coconut cream, salad, and fried potatoes. The sauce for the mushrooms was addictive—spicy and savory with just a hint of sweetness—and I liked the balance of salad with grilled and fried items. LAB reminded me a lot of Bay Area coffee shops—it offers a range of roasts and brewing options, it’s full of people working on laptops, and it’s highly Instagrammable. I got something called “Shake Your Booty,” which was basically a highly concentrated, cinnamon-y iced mocha. There are also a range of sweet and savory pastries, avocado toast, and more substantial breakfast items to choose from. We stumbled across this place in Palermo Soho, but there are a number of them throughout the city. 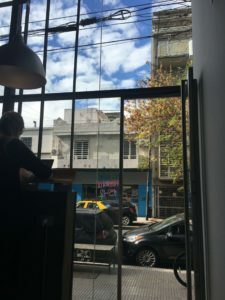 The Palermo Soho branch was both a fancy tea shop and café, and there were a number of pre-made salads, wraps, and sandwiches available. 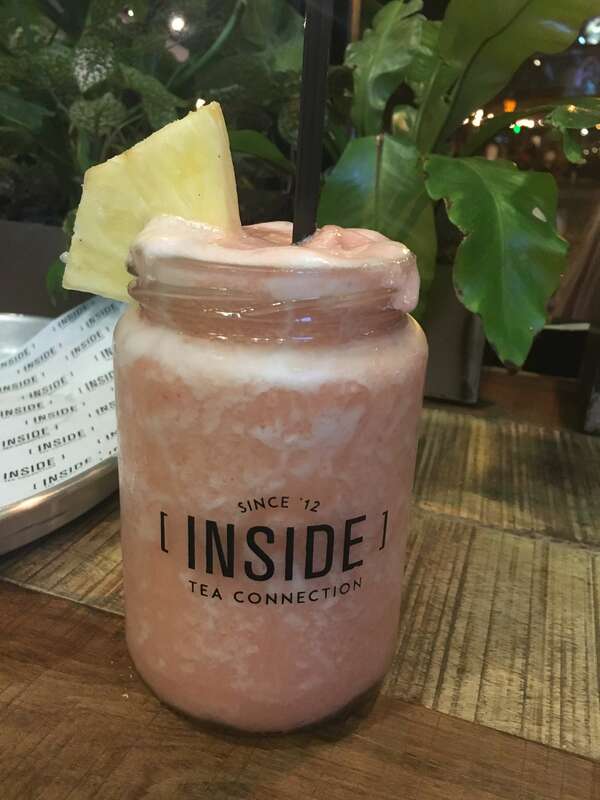 I loved my tea frappé, which was a blend of strawberry tea, fresh strawberries, and pineapple. 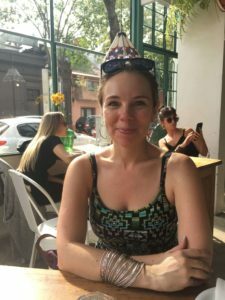 It was also the perfect place to stop for a little pick-me-up around 7–8pm, which is when I would have been eating dinner at home, but which is way to early for dinner in Argentina! Just across the street from Estilo Veggie is Pizza Vegana. We didn’t actually eat here, so I can’t speak to its quality, but it seemed interesting! 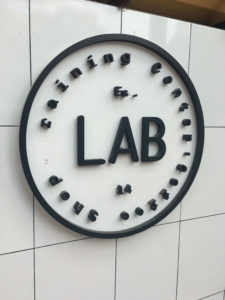 My gluten-free friend said that their pizzas are gluten-free as well, so this place is a must-visit for any gluten-free vegans visiting Buenos Aires. 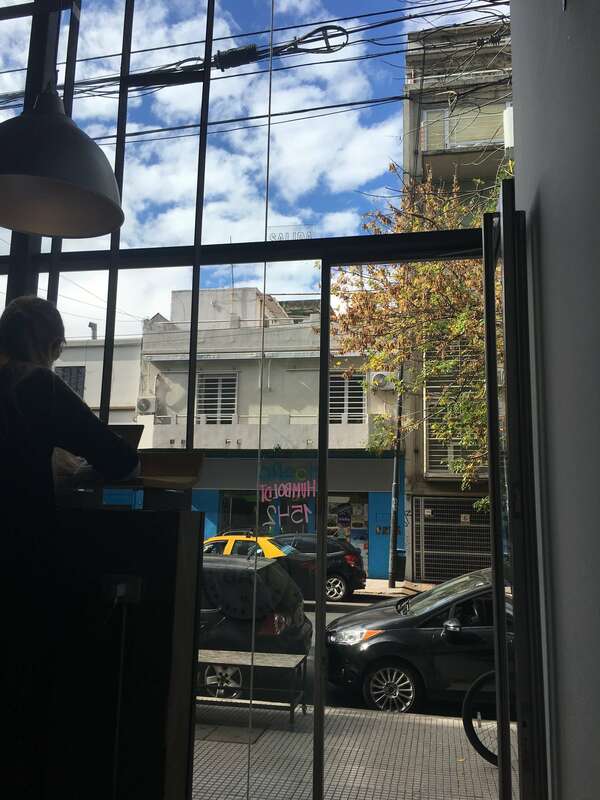 Have you discovered any other great vegetarian or vegan spots in Buenos Aires? Leave me a note in the comments to let me know! Want to be the first to find out about my newest blog content and other news?